Mission Navy Yard offers DJs on weekend nights starting at 9:30pm. Welcome to Mission Navy Yard, a lively bar and restaurant located adjacent to Nationals Park and Audi Field. Known for our vibrant bar scene, daily happy hour, spacious private event and outdoor spaces and delicious Tex-Mex food, we opened in July 2018. Our sister restaurant, Mission Dupont Circle, has been serving strong margaritas and tasty tacos since 2014. We refuse to believe that a restaurant only has one purpose: we aim to provide a bustling bar scene, comfortable dining and versatile private event spaces that can accommodate groups of all sizes. Our spaces are created to be welcoming for brunch, happy hour, dinner and private events, as well as those looking to rewind in a vibrant weekend late night atmosphere. The food was delicious. The margaritas were strong. The service was wonderful. They accommodated my large party on the balcony so that we could have a bit quieter meal. All in all a wonderful birthday. My friends birthday and they were nice enough to embarrass her with a song just like I asked! Thanks for the great service! I would 100% recommend this restaurant. Okay food. Great location. I found it bizarre that the beer prices (if looking by the oz) went up if you bought more. For example, I was there during happy hour and a 16oz beer was $4.75 (or $0.29/oz) and the 22oz was $8.00 (or $0.36/oz). So either they don’t know this or they know this and don’t care and think we are too dumb to realize it. Either way, pretty shady. The restaurant was packed with 5 events making the dining room deafening. The food was mediocre and overpriced. The skinny margarita was overly sweet. Would not choose again. The food was mediocre, the service was mediocre and the drinks were served in plastic glasses. Just a place I would go to if everything else was busy or closed. We enjoyed the food. Service was very good, especially given the post game crowd. Place would be better with some sound dampeners in its interior space. Balcony was better. Food was way too salty. The noise levels were excessive. The service was slow. Opening day of baseball season. Made 11a reservation and confirmed a day in advance so we would have plenty of time to enjoy our meal and get to our seats so we could enjoy the pre-game festivities. When we arrived, we were told they were still setting up the dining room. It wasn’t until 11:20 that we were seated and not inside but outside. And there were plenty of open tables in the dining room. It was a disappointing delay especially given this is a restaurant right across from the ballpark and geared to Nats fans. It should have been ready to make a good impression for the opening of the season. They fell short. After we told our server Katie Wi. we had a game to get to, she made the effort to make up the difference in time lost. Food was slow leaving the kitchen, but our tacos were delicious as well as the guacamole and plantains. Great choices in margaritas! Chips need improving. Weather, waiter, food, drinks, it was all great! Brunch was great! First time at mission and I will definitely be back. Food was great, service was excellent. And the drinks were non stop! Great experience! I can imagine this place being a hotspot during the summer when the windows open. For the colder days, it can get a little noisy during brunch time. Food was pretty good, I got the Mexican brunch. Not bad. Margaritas were very well made. Great food, friendly staff, fun environment, clean environment. 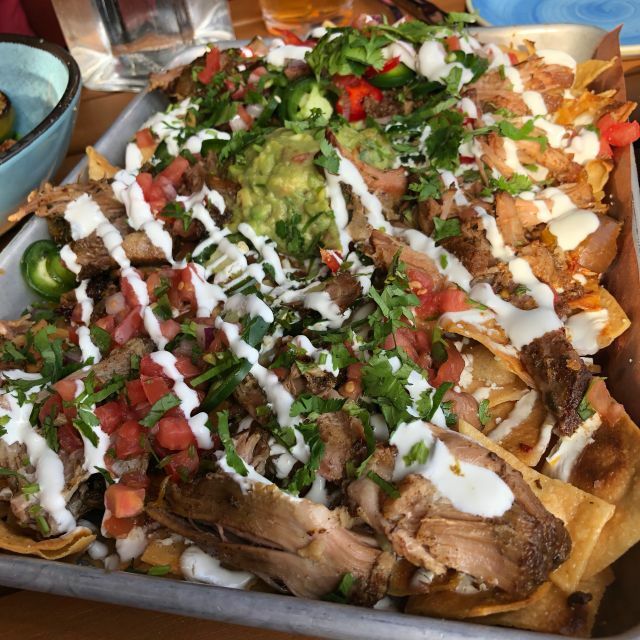 Mission is a can’t miss spot for delicious, melt in your mouth Mexican goodness! First, for those with allergy or dietary concerns, you’ll have no worries here—the menu is full of tempting options to choose from! As someone with gluten insensitivity, I’ve never encountered a problem; both kitchen and waitstaff are well-versed in ingredients, etc. (Recommendation: The fajitas are AMAZING!) Secondly, the atmosphere and vibe at Mission simply elevated the dining experience! Mission is our new spot for consistently wonderful food and fun! We ordered coffee and tea, but they didn't have enough clean mugs to serve us our drinks. We were told we could do a thumb war to see who could use the clean mugs they had. Thinking it would be a short wait for a mug, we didn't mind. However, we didn't get a clean mug and our drinks until the end of our meal--almost two hours later. We were charged for those drinks. Food was just okay. Ambiance was great! Fun place to be, but frustrated with the service. Food was fine. Piper was a great server very attentive. Restaurant was very loud due to a party that did not seem very well contained. Could not even hear each other when shouting. Hard to maneuver in and out of the restaurant. I had a wonderful time for my birthday dinner. However I wish I would of known there was an event that same evening. For this to be my first time at this restaurant it was a bit noisier than I anticipated. Other than that I had a wonderful time. We went to Mission at Navy Yard and had the absolute best time. Our bartender Olivia was the best ever. She was attentive, courteous and professional! She made our time wonderful. The food was amazing, but nothing was better than Olivia. I will return not only for the food and drinks but for the award winning service we received! The breakfast burrito was phenomenal and the bottomless chips and guac was a great complement. We had bottomless margaritas as well and left brunch thoroughly satisfied. I selected Mission because I was dining with guests that had food allergies and off the bat, the menu is extremely helpful because it clearly labels items that are gluten free, dairy free, etc. I had also called ahead and the manager assured me they could provide other allergy friendly options as well. Everything turned out great - we had a variety of tacos (braised piggy, buffalo shrimp, local catch, and steak) - all of which were delicious and reasonable priced for what you get. The restaurant itself can be noisy but I dined here on a Friday night so that's to be expected. It was great! A bit loud too loud in the dining areas, but Louis was awesome, it was spacious, and a great deal for the food and drinks. Great Brunch on Sunday, January 27th. Best house margaritas and guacamole in town! The guac actually tastes like avocados, not cucumbers and mayo!! Chips are wonderful. The host (Sierro, sp?) and wait staff are welcoming, accommodating and very attentive. Our wait person anticipated our every need and kept our chips and salsa flowing as well as our "bottomless" beverages. The Breakfast Burrito was superb, plentifully filled with chunks of white chicken (not "mystery meat!!") and other fresh ingredients. My dining companion's entre of corn cakes and poached egg (Mission's version of eggs benedict) was innovative and reportedly "absolutely delicious!" 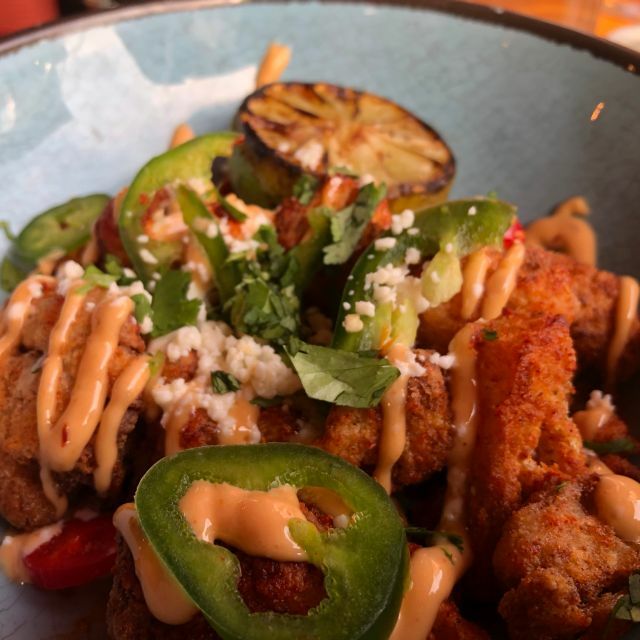 Mission is a wonderful addition to the Navy Yard-BallPark-Capitol Riverfront neighborhood and is clearly at the top of the list of restaurants in the area. We'll be returning time and time again! We had a great time. The wait staff was very accommodating w/ our large group, they let us do family style even tho they had just adjusted the group size above ours to get it. There was never a dry glass and even when we went slightly over the time limit they did not try to push out right away. My Girl had a excellent birthday brunch, would recommend for anyone celebrating a bday! I had my 50 birthday celebration here. They were very accommodating for a party of y’all 15. It is EXTREMELY LOUD, but we were fine with the noise. My entire party complained about the food, specifically the shrimp tacos. I may return simply b/c I liked the hyped crowd, but I will NOT order the food. Love this place! However, it's always packed so it's hard to find bar seating. I wouldn't recommend coming here during baseball season just because you won't find a seat. The restaurant seating area has garage doors instead of walls which makes the seating area EXTREMELY cold in the winter. Not sure whose idea that was. But the margs are amazing, so is the seasonal elote! The food was much better there than the first time we went. They had great vegetarian options for my wife! I would definitely go back again (just not on a Nats or United game day). I was disappointed by how we were served. We were told a group of 8 meant everything would be served family style. We expected portions to be adequate for 8 people. They were not. Instead of doing it family style, why were we not allowed to just order off the menu, so that each person gets whatever entree they like? We were only provided 8 entrees that the kitchen seemed fit to send out, which ended up being mostly nachos. They ran out of some of the entrees too. It was a pretty disappointing experience. It was a pre-birthday dinner with friends. It was so loud we couldn’t hear one another. Very social setting! A bit pricey but the food is tasty. Would recommend going during happy hour or during their game day specials. We had the Bottomless Brunch so that is all I can review. The service was outstanding the entire visit. Once our server realized all four of us were going to stick with margaritas he simply brought a new pitcher each time ours ran low. The same was true for the unlimited guacamole and chips. He in no way attempted to limit the "bottomless" nature of the brunch or rush us along. The entree each of us had was also very good. All in all it was a very pleasant way to spend a rainy afternoon. Very disappointing experience. It was way too loud to talk during dinner even in back dining room. I felt like I was at a giant FRAT party. Food was mediocre & overpriced. Server described faijitas as a giant portion with tremendous presentation. They came out, however, with small portion of chicken, barely any vegetables for $21++. I will not be back here. Much better food & vibes at other places in DC. This place is auditioning to be overhyped, overpriced college sports bar. Go elsewhere! Great experience for election night! Mission Navy Yard offers slow service, and remarkably uninteresting food. Mission Navy Yard has very poor service. Don’t believe the hype. Our meal food and chips were brought at the exact same time.